Why does it feel like nobody has lit the fringe fuse in Edinburgh this year? Richard Jordan: Why does it feel as if nobody has lit the fringe fuse in Edinburgh this year? We’re entering the final days of the Edinburgh Fringe, but where’s the buzz? This fringe has seen no shortage of quality – especially in new writing. Neither has there been a lack of sold-out shows. So why, then, has this year felt that no one really lit the fringe fuse? In past years, there’s been a buzz around certain shows that break out, gather momentum and develop into a fringe-going frenzy. This year, however, I’ve felt a lack of energy around Edinburgh from audiences who are usually bursting to share their thrilling finds with a stranger. One of the crowning achievements at this year’s festival has been the Traverse Theatre’s programme. Many of its productions scooped multiple Fringe First awards and quickly sold out their runs. But the Traverse has become a destination venue. As large parts of the fringe have steadily moved south and occupied space around the Meadows, the west side of the city had become barren fringe venue territory. With only two performance spaces, in contrast to the multiplex venues found elsewhere, the Traverse has in recent years felt further removed from the main fringe hub. As a “destination venue”, it has a greater reliance on advance-bookers, which raises a tricky question: if audiences don’t have a ticket, will they take time out of their busy fringe schedule to travel across town to the Traverse without the guarantee they’ll get in? Pleasance’s ongoing development of the Edinburgh International Conference Centre into a multi-performance venue, just around the corner from the Traverse, is a welcome boost for pulling more audiences in, and keeping them there. It’s also helping to renew a neighbourhood that once had several venues in close proximity, including: Tic Toc at Marco’s; St George’s West; St John’s Church; C venues on Princes Street, and even in 2003 a tent that pitched up in front of the Sheraton Hotel. 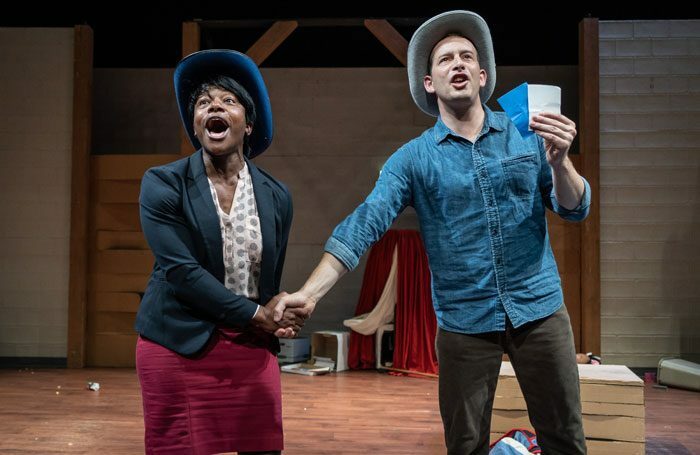 The speed at which many of the Traverse productions sold out is a great testament to its theatre’s team. However, as more fringe-goers arrive and depart the city in their droves, maybe some assume it’s not even worth bothering for returns and, with all that choice, their attention gets directed elsewhere. This is not a problem confined to the Traverse but across any show that’s benefited from a fast-selling box office. It’s a nice problem to have. But in a marketplace of 3,548 shows, if the perception develops that no tickets are available that success can translate into a loss of fringe presence. And fewer people talking about it. This is especially prevalent when you consider that a venue such as the Traverse’s main stage has approximately 316 seats and its second stage 115. With many hit shows playing in venues even smaller than these, it’s only a small share of Edinburgh audiences who’ll actually ever get to see them. Should venues consider creating a daily lottery similar to those applied to many West End shows? This would recognise the fringe’s hits, and ensure continued profile around them, and offer more opportunities for fringe audiences to see them. However, to truly gain the buzz needed for success, a show needs good reviews and a strong word-of-mouth. Over many years, the Scotsman newspaper has been at the forefront in delivering this. “Five stars in the Scotsman” has long been the triumphant cry of the fringe performer thrusting a flyer in your face, but even those cries seem decidedly quieter this year. The Scotsman’s online presence of reviews this year has diminished. They’ve been appearing regularly in the paper but their subsequent move thereafter on to its website has taken time. It’s an understandable problem with the volume of reviews needing to be filed. However, many people around the world plan their visit to the fringe by looking for guidance through the enviable reputation that this publication provides from its dedicated reviewers and editorial team. What’s happened this year is that the delays in publishing reviews online has afforded greater opportunities for many other publications and blogs to step in. That’s certainly no bad thing for the fringe in a fast-changing critical landscape. The Scotsman may still be considered the trusted go-to publication, but it cannot afford to lose its position as being the essential festival guide. Equally, if any publications end up running reviews only once the fringe has ended, they’re of no value to audiences planning a trip to Edinburgh and researching what to see, who will instead look elsewhere for their information. For the time being, a good review from the Scotsman running both in the paper and online during the fringe can still make a big difference to a production that needs to sell tickets and cover its costs. The importance of good and accessible critical commentary at the fringe is crucial to its success. It serves as a catalyst to help steer audiences towards what to see, and they in turn will share their finds with others. This all helps towards giving a show necessary presence, and ultimately providing the fuel needed to give the fringe its buzz.